(2001 - Canada) Jackie York (Crewson) is a 39-year-old famous novelist with an adoring public, building anticipation for her next book, and she has a big secret. She is suffering from writer's block. In fact, it could be a case of life block. After being romanced, manipulated and dumped by a wannabe movie director, Jackie just can't get back to work. Publicly she pretends to be having a love affair with famous writer Lionel Heathcote (Coyote), but privately she's caught in a spiral of loneliness, but her protective shell is cracked by an unexpected source - Patrick McKeating (Cobden). He's a brilliant writer with an inspiring enthusiasm for life and a wicked crush on Jackie. But there's just one minor problem. Patrick is nearly 20 years younger than Jackie. With her distrust of male admirers on high alert and her carefully cultivated public image on the line, Jackie is about to get a long-overdue lesson on what really matters in life. 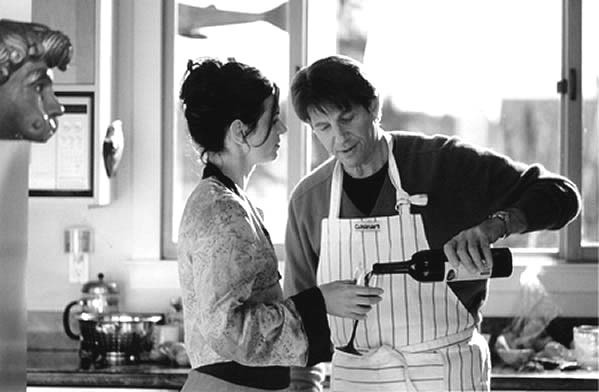 "A very funny look at the repercussions of an older woman-younger man relationship... Peter Coyote gives a wonderfully subtle and gently humorous performance as Jackie's closest confidante... Witty and smart, Suddenly Naked is one of Wheeler's best." "Mrs. Robinson was the original cougar, but The Graduate was told from the elated point of view of the younger man, and we weren't privy to the older woman's emotional life. That's where these films have a chance to explore something new. Suddenly Naked does attempt to examine what might be compelling about a younger man and, to its credit, it goes beyond the cliché belief that it's a matter of sexual potency." 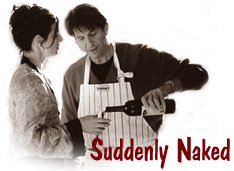 "Suddenly Naked is a low-budget production, which was shot in just 23 days. That's lots of angles within each day. My compliments to the director for a work well done under breakneck conditions and having produced a work that easily matches up with any large-scale Hollywood production -it's so full of life and convinced me of it´s closeness." "Charming, witty - the latest from one of Canada's most prolific directors." "Suddenly Naked is a light piece of entertainment, pushed along by the energetic performances of the leads. It's far from romantic comedy's shining moment - but it's a nice twinkle in the genre." "In this lively romantic comedy from Cananda, actors Wendy Crewson and Joe Cobden give off sparks in bed and out, as Jackie and Patrick, an acerbic 39-year-old novelist and her exuberant 20-year-old protege and lover. Jackie quickly adds their affair to her list of closely held secrets, which includes a case of writer's block and the fact that her much-publicized romance with another novelist (a sweet Peter Coyote) is really just a friendship." "Women have given it [the film] really high marks and the men have been mixed. And it seems that middle-aged men in particular are not really enjoying it [laughs]. And Ill let everybody else analyze what that means  but its almost amusing... I guess they dont find the idea of older women and younger men a trend they want to continue. They dont find that funny at all." The film was shot in only 23 days on a low budget. It garnered six Genie nominations and won for Best Editing. It was featured at several festivals - Berlin, Toronto, Vancouver and Maui Film Festivals. Anne Wheeler also directed the acclaimed film, Better than Chocolate.